Tiger Woods will make his second start of the year at the 2019 Genesis Open, an event he hosts at the Riviera Country Club in Pacific Palisades, Calif. The 2019 Genesis Open tee times begin at 9:40 a.m. ET on Thursday and the tournament will crown a champion on Sunday on CBS. It's raining in Los Angeles already, and more precipitation is expected throughout Thursday morning and midday Friday. Mother Nature will ease up over the weekend for those who make the cut, as the forecast calls for sunny skies and temperatures around 60. The live 2019 Genesis Open odds have Woods going off at 20-1, well behind favorite Dustin Johnson at 8-1. Big names like Justin Thomas (11-1), Rory McIllroy (12-1), Jon Rahm (12-1) and Jordan Spieth (18-1) are also expected to be in contention. And with so many big names taking aim at this $7.4 million purse, be sure to see the top 2019 Genesis Open picks and PGA predictions from SportsLine's golf projection model before making any plays of your own or entering a PGA DFS tournament sites like FanDuel and DraftKings. 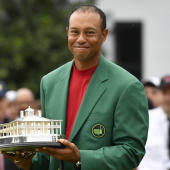 SportsLine's prediction model, which was built by DFS pro Mike McClure, has nailed four of the past eight majors entering the weekend and called Tiger Woods' deep run in the PGA Championship despite being a 25-1 long shot. The model has been spot-on early in the 2018-19 season. It was high on champion Rickie Fowler at the 2019 Phoenix Open, projecting him as one of the top six contenders from the start. It also correctly predicted Brooks Koepka's (9-1) victory at the CJ Cup earlier this season. Additionally, it correctly called Bryson DeChambeau's (9-1) seven-shot victory at the 2019 Omega Dubai Desert Classic. Anyone who has followed the model is up huge. Now that the 2019 Genesis Open field is locked, SportsLine simulated the event 10,000 times, and the results were surprising. One huge shocker the model is calling for: Woods, a 14-time major champion and one of the top Vegas favorites, doesn't even crack the top 10. Another surprise: Bubba Watson, a 20-1 long shot, makes a strong run at the title. He has a much better chance to win it all than his odds imply, so he's a target for anyone looking for a huge payday. Watson comes into the Genesis Open 2019 on the strength of an extremely strong performance at the Waste Management Phoenix Open where he took fourth place last week. He fired three rounds of 68 or lower before a final-round 71 cost him a chance at the title. The 12-time PGA Tour winner is hitting the ball extremely well to open the season, ranking in the top 20 in driving distance (306.1 yards) and in the top 15 in greens in regulation percentage (76.1). As the defending champion of the Genesis Open, Watson should have plenty of confidence playing this course, so he has a strong chance to climb the 2019 Genesis Open leaderboard and finish at or near the top again this year.